Today, out of the corner of my eye in lecture, I saw a guy sitting in his desk with his left leg hugged to his chest. This allowed me a peek at his kicks, and I was taken aback. He wore black Vans that were exactly like mine. I’ve been meaning to blog about this for awhile. I was thinking about celebrities, the red carpet, and why they insist on purchasing clothes at outrageous prices. Your common, and I might add economical, consumer would scoff at the idea of purchasing jeans for $100 when an identical pair can be found for half the price — or, if you’re looking for a real treasure, at $20 or less. Why, then, do celebrities buy expensive clothes? Why are clothes that expensive? This is my very surface hypothesis. I understand that there exists some science and artisanship to clothery, but I postulate that higher fashion is so expensive because it markets itself to individuality. 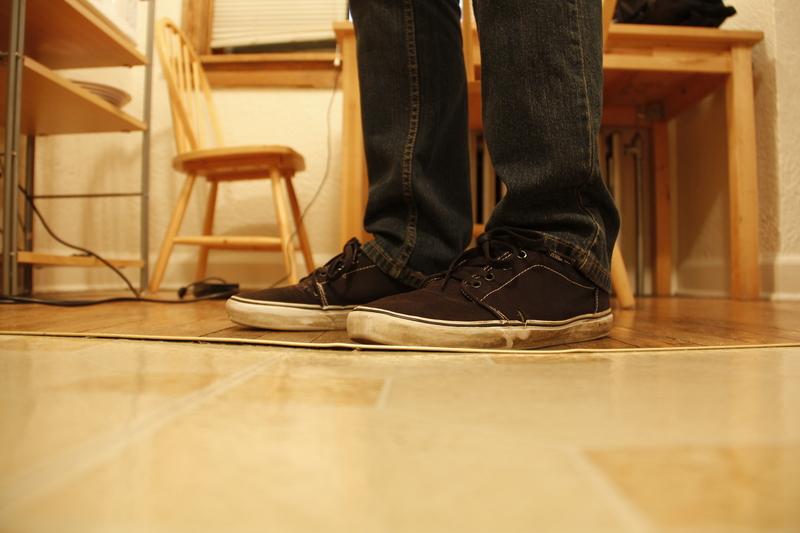 When I saw my black Vans on someone else I became embarrassed. I started to compare myself to him. “Well, at least I’m wearing skinny jeans.” He was too. “Uh, well, at least my skinnys are a dark wash.” His were too. “D’um… well I would never wear such a raggy top like him.” I usually don’t wear loose and raggy tops, but today I was — and, even then, I think raggy tops are a fine look for certain occasions. Do you see? Fashion is about exclusivity and uniqueness. Similar to how I feel about my black Vans, I hate being around people that have a pea coat like mine. I am OBSESSED with jackets — especially winter wear. I love pea coats. I bought my first one from Old Navy, but I was never in love with the fit so I gave it to my dad last winter after I bought myself a new one from the Gap — and I laid down a pretty penny for it. Then, one day last winter when I was coming back to my dorm, I saw another punk with a pea coat like mine. He had a collar that only stood behind the neck, epaulets that showed off their regality, and a slim fit that I shamelessly love. It was exactly like my pea coat! And I hurried up the stairs so I wouldn’t be in the same area as him — because that’s what fashion does to you. Unfortunately, the dime I paid for my pea coat did not grant me an exclusive look, but the nickels that celebs dish out for their clothes do. And I think that’s why celebrities pay so much for clothes, and why high fashion is so expensive. Novelty is crucial in the fashion arena, and, apparently, novelty has a price. The kid in my lecture wasn’t wearing black Vans. They were black on the sides, and had some sort of checker design that I was blind to from my angle. Honestly, if I wanted to be a white boy, I would have wanted to look and dress like him. Note: I don’t hate everyone that has the same clothes and fashion as me. I often appreciate how others carry their look, and especially those who carry a look similar to mine. For whatever reason, though, I find that I also become jealous. It might look like I don’t take care of my shoes, and I really don’t, but I should. I usually buy a pair and wear them all day and everyday until they die. I become very attached to them. Example: I haven’t thrown out my last pair which were grey Asics with a wine red highlight.